A lot of you reading this review won’t remember the controversy and hullabaloo when PRIMARY COLORS hit the screens back in ‘98. The book it’s based on was originally credited to “Anonymous” as it is in the movie’s credits. Written by political journalist/columnist Joe Klein, the book and movie were both supposedly based on Bill Clinton’s first presidential campaign. And after watching John Travolta and Billy Bob Thornton doing dead-bang near perfect impersonations of Bill Clinton and James Carville it’s hard to argue against that. But even if you don’t know a dodgamn thing about Bill Clinton or his presidency, PRIMARY COLORS works as a spectacularly insightful political drama/satire/comedy on all levels due to the exceptionally strong work of the amazing cast. Sure, there are a few serious bumps along the way but on the whole, PRIMARY COLORS is a Must See Movie about American politics. 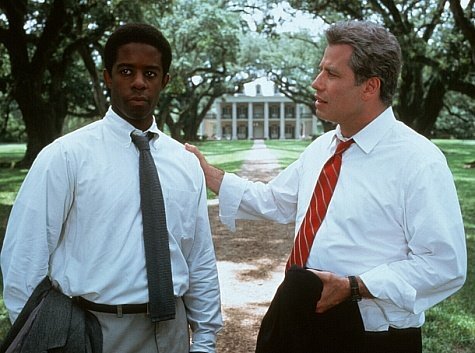 Henry Burton (Adrian Lester) is the idealistic grandson of a 1960’s civil rights leader. He’s involved in American politics in small ways until he’s practically kidnapped into the presidential campaign of Senator Jack Stanton (John Travolta). Henry’s extremely reluctant to take the job of Campaign Manager until he sees Stanton interact with the public, especially at a meeting with the students of an adult illiteracy class where Stanton brings everybody to tears with the story of how his Uncle Charlie won the Congressional Medal of Honor but didn’t have the courage to admit he couldn’t read. Uncle Charlie will also be influential in other ways later on in the story I dare not reveal. Believe it or not, despite my description, PRIMARY COLORS is actually very funny at times. And it worked for me because it made me feel as if I were really getting inside the heart of a political campaign and seeing how it operates. I liked the scenes where it showed that while Jack Stanton is out shaking hands and kissing babies, it’s his staff that is actually making the pivotal decisions for his career. I liked the scenes where Richard walks into a room and immediately lies down on a bed or couch and fields questions from the other staff members and formulates strategy as if it’s something he was born to do. I liked how Henry struggled to hold onto to his core values and principals even in the face of such blatant manipulation of public opinion and perception by not only his staff but everybody else involved in the presidential race. Adrian Lester I knew from the British crime drama “Hustle” and was pleasantly surprised at seeing him in this movie. His British accent and manner slips through at times but he’s good at being our eyes and ears into the Stanton campaign. Maura Tierney is just as good as Daisy Green but then again, Maura Tierney is good in every role I’ve seen her play. Supposedly there’s a romantic subplot between Daisy and Henry that got cut and I can understand why. We see a couple of scenes with the characters together in bed and that’s all we really need to know because the real love affair these characters have is with politics and not each other. And every time I see this movie I fall in love with Emma Thompson. She’s simply amazing and totally into the role. I don’t think she’s going so much for a straight-up and down Hillary Clinton impersonation as she is trying to get us to understand the mindset and drive of women who link their destiny to that of men like Jack. The genius of the movie is that we never get a scene with Jack and Susan alone where we get to hear what they discuss in private, away from advisors and press and I like it that way. But it’s John Travolta and Kathy Bates who clearly walk away with the movie. As Jack Stanton, Travolta plays a man who is so full of charisma that people fall over themselves to just be in his presence. It’s a performance that just leaves me amazed every time I see it because Travolta does such a good job of disappearing inside of Jack Stanton. And he makes Jack Stanton his own character. Sure, we see Bill Clinton in there because that’s who it’s supposed to be but Travolta puts spins on the character and I appreciate that he did so in order not to make Stanton a caricature. 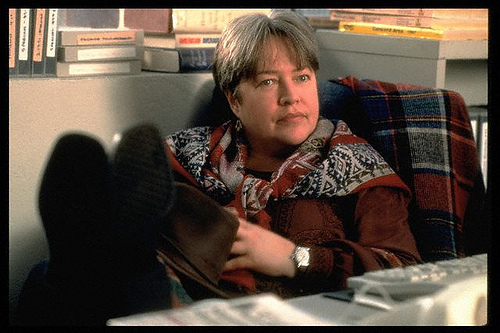 And Kathy Bates as Libby is the soul and conscience of the Stantons. She has a marvelous scene near the end of the movie where she shows Jack and Susan pictures of the three of them when they were young and idealistic and thought they could change the world. And then she begs them to make the right decision. They don’t. And it’s a decision that seals Libby’s destiny. So should you see PRIMARY COLORS? Absolutely yes. It’s a movie full of laughs but it’s also a movie full of seriousness. It feels honest and it feels real. It also feels joyous and sad. It gives hope and then takes it away. 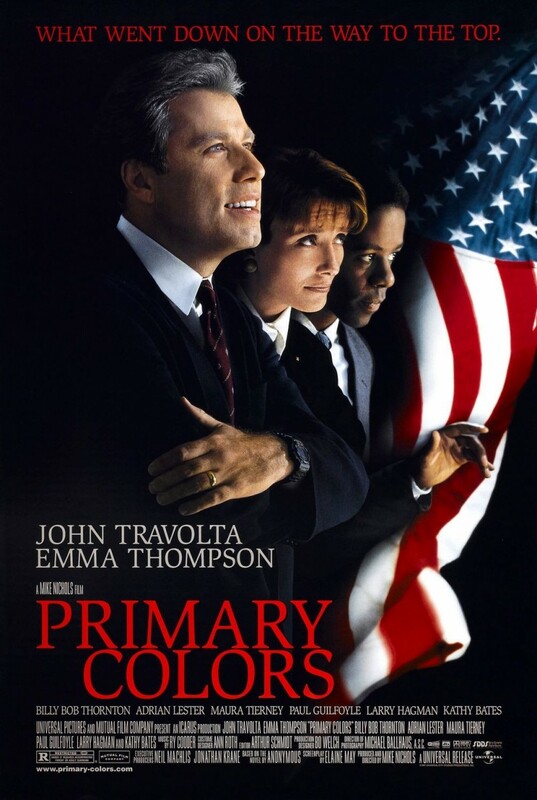 I’m the first person to scoff at a movie that claims to be based on real people or events but somehow I got the sneaking suspicion that PRIMARY COLORS at times comes uncomfortably close to the truth of how politics in America really are.